Bell quarterback and defensive lineman Jeremiah Richardson was a two-way star for the Griffins, leading them to the DCSAA title. WASHINGTON — Jeremiah Richardson enrolled at Bell Multicultural High School this past summer and tried out for the football team. Coach Daniel Tyson and his staff had the 5-foot-8, 185-pound senior practice on the scout team defensive line. A few weeks into the season, Tyson learned that Richardson had played quarterback as a youngster. “And we needed a backup quarterback,” Tyson said. So the team put in a package of plays in case they needed Richardson under center. That package was unveiled this past Saturday, when the undefeated Griffins were struggling offensively in the biggest game of the year. Enter Richardson. He took over at quarterback and rushed for 115 yards and three touchdowns and passed for 90 yards and another score as Bell beat Kingsman Academy, 32-22, in the DC State Athletic Association Class A championship game. Richardson also was stellar on defense, registering three sacks and returning a fumble 65 yards for Bell’s other touchdown. 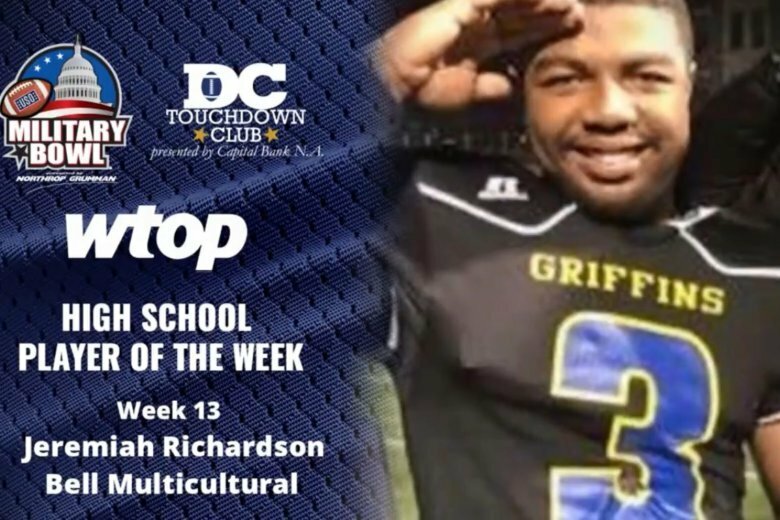 For his efforts, Richardson was named the Military Bowl DC Touchdown Club High School Football Player of the Week. Oakdale QB Collin Schlee threw three touchdown passes as the Bears beat Elkton, 38-0, in a Maryland 2A semifinal. Glenelg WR-LB Michael Doughty caught a 19-yard touchdown pass and recovered a blocked punt in the end zone for a touchdown as the Gladiators beat New Town, 35-0, in a Maryland 2A semifinal, advancing to their first-ever state championship game. Woodgrove QB Graham Walker rushed 19 times for 119 yards and two touchdowns and completed 10 of 15 passes for 197 yards and two touchdowns as the Wolverines beat Sherando, 27-3, in the Virginia 4A Region C final. Quince Orchard QB Brian Plummer completed 7 of 10 passes for 111 yards and a touchdown as the Cougars beat Wise, 31-6, in a Maryland 4A semifinal. Westfield RB Eugene Asante rushed 17 times for 114 yards and two touchdowns as the Bulldogs beat Madison, 17-7, in the Virginia 6A Region D championship game for their 37th consecutive win. Douglass RB Geo-di Tolbert scored the go-ahead touchdown on a 66-yard run midway through the fourth quarter — his first carry of the day — as the Eagles beat Dunbar-Baltimore, 20-6, in a Maryland 1A semifinal, ending the Poets’ winning streak at 23 games. Freedom-Woodbridge WR Umari Hatcher caught a 36-yard touchdown pass in the final minute to lift the Eagles to a 21-16 win over W.T. Woodson in the Virginia 6A Region C championship game. North Point QB Asa Williams threw one touchdown pass and rushed for two more scores as the Eagles beat Mervo, 23-13, in a Maryland 4A semifinal. We’ll see you in the District Saturday! Note: Friendship Collegiate vs. H.D. Woodson has been moved to Eastern HS at 3 p.m. Saturday.